November 11, 2018, marks the 100th anniversary of the end of World War I, but some researchers already have been busy preserving the past. Dr. Pascal Sirguey had waited two years for this day and he was taking a few final minutes to savor the moment. It was a sunny morning in early 2017, and students, historians and scholars had gathered in Arras, France, to attend the remembrance ceremony of the Battle of Arras in World War I. 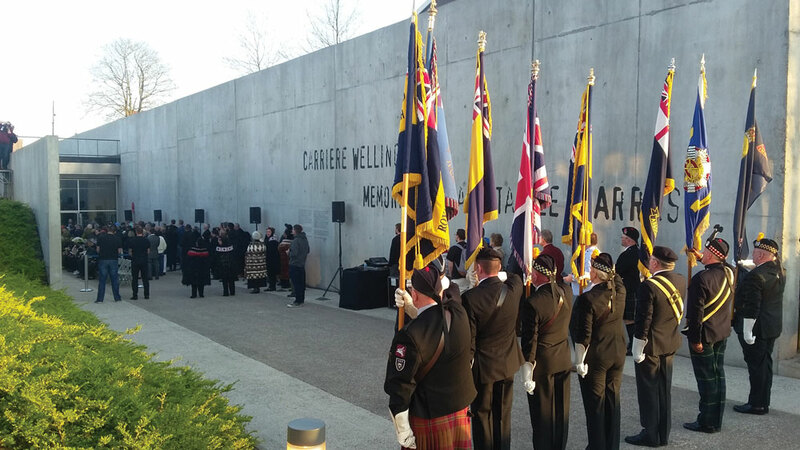 While this year marks the official end of World War I, the commemoration marked a little-known, yet significant contribution of New Zealand to the war efforts in helping to win the legendary battle. Sirguey’s efforts would document one more chapter in the Great War. Sirguey is a senior lecturer in the National School of Surveying at the University of Otago in New Zealand. His attendance at the ceremony was the culmination of an ambitious two-year scanning project that captured more than half of the historic underground network of tunnels and quarries in Arras. During World War I, some 120,000 New Zealanders were sent overseas. Among them, were the men of the New Zealand Engineers Tunneling Company (NZETC), a tough bunch made up of miners, quarrymen and laborers with a secret mission to help underground warfare and thwart the advances of enemy forces. The tunnelers were the first New Zealanders deployed on the Western Front in March 1916. 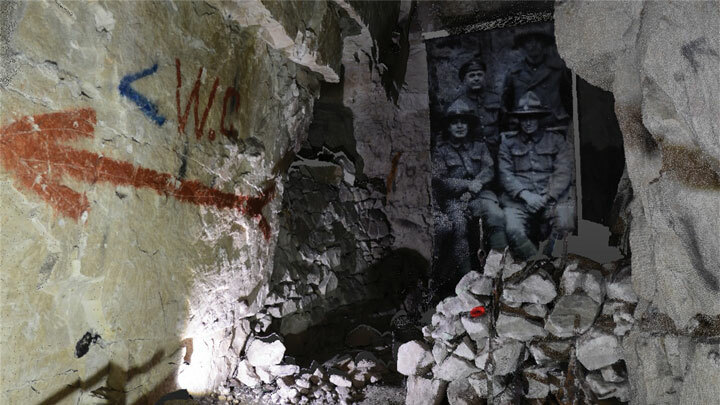 Working ahead of a major battle planned by the allied forces to break the German front in April 1917, the tunnelers were tasked with connecting a network of abandoned chalk quarries, some dating back to the Middle Ages. They would create a 2.3-km long subterranean passage where allied soldiers could easily move underground and eventually take the enemy by surprise on the morning of the battle. The tunnels and quarries were far from simple dirt shafts, however. They could accommodate 24,000 men and included a light rail system, fully equipped hospital, electric lights, kitchens, latrines, running water and living quarters. The goal was to develop these spaces so assault troops could live underground yet secretly access the frontline. The tunnelers named the main quarries after towns in New Zealand, from Russell in the north down to Bluff in the south. After the war, the tunnels were forgotten until rediscovered in the 1990s. Sirguey and his colleague Richard Hemi, also from the surveying school at the University of Otago, learned of the tunnels after Hemi attended the opening of a tunnel in Wellington honoring New Zealand’s WWI involvement and the role of the counter-miners. “I am from France and lived half an hour from the site but had never heard of the tunnels,” Sirguey said. Their interest piqued, they devised a project, LiDARRAS, to use LiDAR technology and capture a permanent digital record of the tunnels. It would require surveying and scanning what remained of the network and creating 3D models and virtual environment of the caverns. Having the right technology was critical. 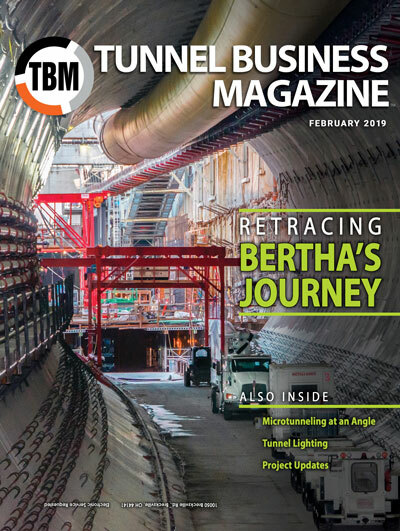 Sirguey had used Trimble products in his classes and after talking with scanning expert Gregory Lepere in Trimble’s France office determined the Trimble TX8 3D laser scanner would be ideal for the project. The TX8 can collect 1 million points per second, producing 3D coordinates with millimeter precision. 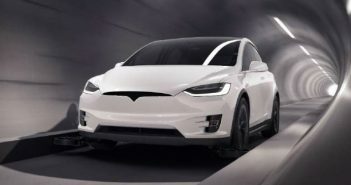 It has a photographic capability that assigns real color to any point, enabling high-density color data and realistic texturing of a 3D model, even in the dim light of the tunnels. Sirguey and Hemi envisioned LiDARRAS as a bicultural project, with resources coming from universities in New Zealand and France in a collaborative effort. The University of Otago was already committed, and Sirguey contacted the École Supérieure des Géomètres et Topographes (School of Geometers and Topographers) in Le Mans, France. Between the two schools, five students were chosen, with a lead student from each country committed for the long term. Safety was a primary consideration. Some of the network had been reinforced during the Cold War as fallout shelters and were deemed stable, but Sirguey’s team met with archeological experts from the city of Arras for a walk-through to assess the network. They confirmed that out of 2.3 km of tunnels, at least half of the area could be safely accessed. While the tunnels were well ventilated by natural air currents, the team was still required to carry gas detectors as part of a strict health and safety plan. The temperature stayed at a consistent 10°C with 100% humidity. There was a technical learning curve as well. Some students had used Trimble’s TX5 for scanning projects, but not the latest generation of TX8. In addition, Lepere provided training on using the TX8 with a Nikon D7100, which would capture imagery at 90-degree intervals. A fish eye lens provides overlap between photos to create a single panorama at each scan station. While the scanner can measure in total darkness, researchers needed sufficient lighting for photography. The additional illumination came from battery-powered spotlights placed under the instrument tripod at each scanning station. Three different exposures were captured from each station, with a total of 12 individual photos used to colorize a single scan station point cloud. To reduce error, each group of 12 photos was imported together. The software would use these to render a panorama. This process was completed for all 814 scans. The RealColor function in Trimble RealWorks 10.1 software was used to colorize each scan. Students, with supervision from staff from each surveying school, worked eight hours a day and sometimes weekends during two survey campaigns totaling about six full weeks of underground fieldwork. The team alternated between underground and above ground, where they performed survey loops for geo-referencing and collected scans of the cityscape to provide context to the underground structure. They completed up to 63 scans per day and captured panoramic photos to colorize the point clouds. Scanning began in one quarry and progressed day by day to the end of another quarry. Once these scans were captured, the students moved to other areas of the subterranean network. Scans were initially processed in RealWorks for registration and georeferencing. Back at the hotel, they pre-processed the day’s data to ensure it had been collected properly. The Wellington quarry is a museum open to the public, so the students sometimes had to work around public tours. The pilot survey started right after the Nov. 13, 2015, Paris terrorist attack, however, so most tours in the tunnels were cancelled and scanning in the museum was given priority. The speed of the TX8 was phenomenal, Sirguey said, and the ability to use it with an SLR camera was critical to the team’s progress. 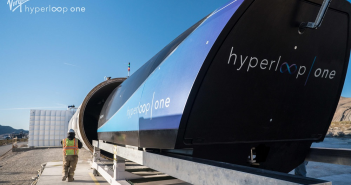 Over the course of the project, the team completed nearly 1,000 scans using mainly the Trimble TX8 scanner, collecting about 100 gigapoints (100 billion points), making it one of the largest scanning projects of its kind processed in New Zealand. The final resampled point cloud at 2mm spacing is about 25 gigapoints. The control network was established for the tunnel and quarries but teams extended it to the outside so they could get good GNSS static positions and tie it to the regional grid. In addition to the scans, 9,768 high-resolution photos were captured and processed into 814 panoramas. A georeferenced network of 32 control marks, including outside and underground marks, was surveyed with static GNSS and total stations. Closed traverses were used to carry control through the tunnels, and the network of observations was adjusted via least squares estimation. Scan data was processed in RealWorks to create a variety of digital data products, including raw scans; full scans that were registered, colored and georeferenced; a resampled point cloud at 2 mm between each point; and photo panoramas. Beginning in April 1917, members of the New Zealand Engineers Tunneling Company (NZETC) began creating a 2.3-km long subterranean passage under enemy lines. Shortly before the project was complete, Sirguey and his team were invited to attend the remembrance ceremony of the Battle of Arras in France and present the findings of the project. They shared details of their work and unveiled the latest animation of the underground network dataset. The team also generated a fly-through inside the 3D point cloud, exemplifying the full extent of the completed survey (available at youtu.be/0DkPwl25dC4). To generate the fly-through, Sirguey had one of the students create a number of “rush” animations of various sizes. Sirguey determined the speed and renderings. It took about two weeks to clip and mount the rushes together with music to form a narrative. The fly-through was later gifted to the museum. Additional animations and navigable 3D models were created for museum and public use (see www.otago.ac.nz/lidarras), and a 3D model has been archived as a digital record to ensure the many attributes of the structure are protected, including parts at risk of being lost through deteriorating chalk or alteration of tunnels due to urban development. A screenshot of the TLS data showing high density and resolution of the data captured. The project didn’t end with the commemoration. 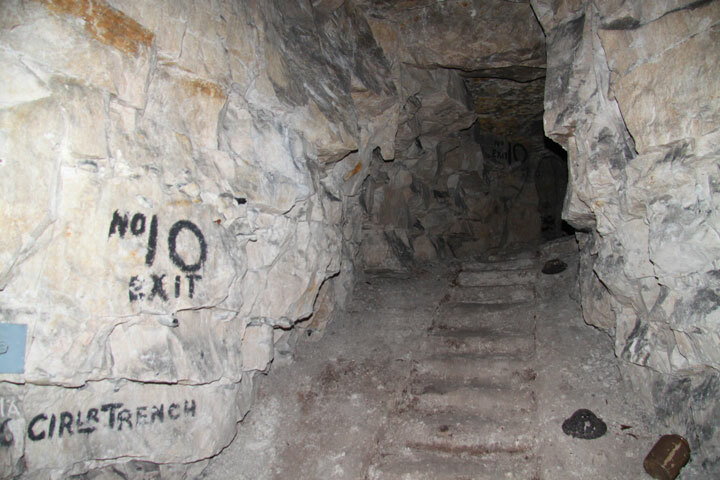 In summer 2018, a regional agency conducting an inventory of tunnels in northern France approached Sirguey about his work at Arras. The agency had heard about the success of LiDARRAS and asked for assistance in producing a “light” resampled version of the point cloud, as well as a footprint of the area scanned to contribute to its inventory. Sirguey and his team are now in discussion with the New Zealand National Library about archiving the results. In addition, the Toitu Otago Settlers Museum, an early partner of the project, has invited them to give a lecture in the context of exhibitions of the World War I battles.